Riding my bicycle home not long ago, I encountered a police officer videotaping bicyclists at Ladd Circle, on one of Portland’s most popular bikeways. More than 4,000 cyclists a day circumnavigate the large, landscaped roundabout — the salient feature of the historic Ladd’s Addition neighborhood. Gazelle - Taking you further! from Gazelle Bicycles Australia on Vimeo. Ever hear of -- or read -- Yahuda Moon and the Kickstand Cyclery comic? As early as this summer, residents and visitors taking quick trips in Boston will be able to rent bicycles from dozens of sidewalk kiosks, under an agreement expected to be signed today that will create a bike-sharing network inspired by those in Paris and Washington. Boston officials said the system, to be called Hubway, will open in July with 600 bicycles and 61 stations in the city, though they envision growing in a few years to as many as 5,000 bikes at more than 300 kiosks, from Brookline to Somerville. At an afternoon ceremony with bicycling advocates, Mayor Thomas M. Menino is scheduled to sign a contract worth nearly $6 million with a company called Alta Bicycle Share to build and operate Hubway for three years. Alta is also behind a program that debuted last year in the Washington area and now boasts 1,100 cherry-red bicycles at 114 stations. There was a time not all that long ago, when hydraulic brakes on mountain bikes were viewed as super-high-end equipment for the elite few. Now, virtually all bikes over the mid-range price point have them. At last weekend's Sea Otter mountain biking trade show in Monterey, a new product was unveiled that could lead to the same thing happening with gear-shifting, as German component-maker Acros presented its A-GE hydraulic shifting system to the world. We do a fully loaded shakedown ride with the Bromptons from Beaverton to Cape Lookout on the Oregon coast. Our friends Brian and Cynthia from Santa Monica join us with their Dahons. A lot more climbing than we were expecting but it was a great time! The 9th Annual Community Ties Ride promises to build on the break-out success of the 2010 ride, with well-marked routes through scenic Delaware County, multiple snack stops featuring homemade cookies, and another delicious and healthful, locally grown and made lunch provided by Graumlich Family Farm under a large outdoor tent. More than 250 riders participated in the 2010 ride, making it the largest turnout ever with all proceeds going to support multi-purpose trail development in Delaware County connecting with the statewide Ohio to Erie Trail. The ride features options of 31, 62 and 100 miles as well as an 8-mile Family Ride, and includes scenic areas, rare bird habitats, parks, new sections of the Ohio to Erie Trail, well-marked route maps and SAG vehicle. Registration is from 7 - 9 a.m. The ride will start/end at Northside Community Church, northeast corner of S.R., 3 and Freeman Road in Westerville, site of the homemade lunch. Pre-registration cost is $20 per rider, or $20 per family participating in the Family Ride. Day-of-ride registration is $25. Registration includes a one-year membership to the Delaware County Friends of the Trail. Ryan from NYC was at start with his family and they left before us. As we headed east we passed Ryan who had blown a spoke and needed a replacement. When we reached the grocery store near the lake we ran into Steve Miller who rode with us. He also indicated that Ryan was able to find a spoke from another rider. At the 100 mile split Ashley continued on. Steve and I met Tom and a group of riders and hung with them to the finish to fight the headwinds. When we finished the winds were up to 30mph gusting over 40mph. 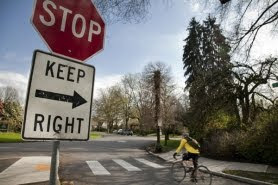 The death of cyclist Steve Barbour in 2009, the trial of Ed Miller and the deaths in 2010 of Columbus cyclists Jeff Stevenson and Trent Music have created a palpable tension between motorists and cyclists in central Ohio. A war of words has erupted in The Dispatch. Cyclists are rightfully angry that one of their most cautious and beloved brethren was killed and then blamed for causing his own death. Motorists argue that cyclists drive carelessly, should "pay for" using the roads though licenses and taxes and should not be allowed on certain roads in the first place. Let's step back, take stock and address some of these concerns. Why are cyclists allowed on the roads? The roads in Ohio, and throughout the U.S., are public ways open for all to exercise a constitutional right to travel. Bicycles were on the roads before cars existed. Bicycle operators were included as legitimate, legal road users in the first traffic laws and rules of the road in all 50 states. Under Ohio law, bicycles may use every non-freeway road and may not be banned from the roadway. The city is dying for a few good cyclists -- but handbag owners need not apply.